The Public Prosecutor summoned human rights activist AbdulHadi Al-Khawaja on 13/1/2009 to investigate the background of his speech in a religious occasion of Ashura in the evening of 6/1/2009. Al-Khawaja was charged with the promotion of the change of the political system, the public incitement of hatred against the ruling regime, broadcasting rumours and propaganda that cause disruption of public security and damage public interest. In his public speech Al-Khawaja called the public for (interest and psychological disengagement with the unjust regime and not to pledge allegiance to it). He said that the regime humiliates people. He also described the royal family more than once as the (ruling gang). He felt (the need for uprooting the ruling family from power at any cost and sacrifices). He pointed fingers to top 14 persons in the State as members of the (gang) including: the King, Crown Prince, Prime Minister, a number of ministers and senior officials. He named them and accused them of theft, the killing of innocent people, the practice of sectarian and treason, lying, and other similar descriptions. He continued with what was understood as promoting the use of violence by saying (it is political naivety to merely demand partial reform, and pledge to continue political allegiance to this ruling gang which lacks faith, principles and ethics. It is only possible to confront sectarian and alienation policies by calling for the overthrow of this unjust and sectarian gang). He also called for what he termed a "revival" and for striving (to cut the roots of the ruling gang from this purified land, for we are the generation of anger and revival). Despite the fact that Al-Khawaja has called for radical change through the use of (peaceful protest), he sees the (legitimacy of violence) as a justified reaction to government actions. According to him, (the government has given all legitimacy and justification to its opponents and victims to resort to violence). 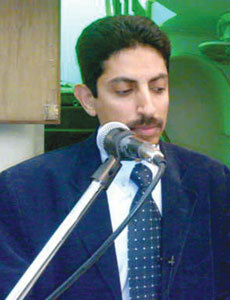 Al-Khawaja said that the slogan (Death to Khalifa Family) is full of anger, negative and unrealistic. He suggested replacing it with another slogan: "let us overturn the ruling gang" because this slogan clearly specifies the objective, i.e. their removal from power. Al-Khawaja had pre-empted the investigation by saying in a press statement that he will confirm the views expressed in his speech, saying he would not answer to any question, and will not sign any statement, accusing the Department of Public Prosecution of being (bias and the Judiciary not independent). He added that the judicial ruling will be (as a result of a political decision, and not the result of judicial proceedings), and, therefore, (it is pointless to reply) to the questions of the Public Prosecutor. According to three lawyers, accompanied Al-Khawaja during the investigation, he refused to answer most questions, and also refuted his call for the use of violence. Based on the investigation, which lasted for three hours whilst 20 people protested against the investigation outside the Public Prosecutors' office, the prosecution released Al-Khawaja on bail pending the filing of a lawsuit against him. The case will be considered on 8/2/2009 before the High Criminal Court. Al-Khawaja's speech was embarrassing to many parties. But it was most embarrassing to two fronts: Bahrain's political societies (political parties), Bahraini, regional and international human rights associations, as well as other civil society organizations. The speech has raised the level of demands to its peak so far, surpassing what has been regarded as national fundamentals as well as advocating the demolition of the existing political process. Some political societies regarded the speech a departure from the usual political discourse with its inflammatory references to the use of violence. For example, Khalil Marzooq, Vice-Chairman of the parliamentary bloc al-Wifaq, referred to the fundamentals since Bahrain's independence in 1971, and to the Constitution of 1973 by saying (we have never called for overthrowing the regime but we have always demanded democratic and political reforms). He added: (we call upon the authorities to address the outstanding issues of discrimination and naturalization. We do not demand the overturning of the regime. We are not interested in this proposal or any other proposal apart from our declared objectives and political actions through peaceful approach). Sheikh Mohammed Ali Mahfouz, Secretary-General of the National Islamic Action Society, commented on Al-Khawaja's speech by saying that his society advocates genuine reform, and (that everyone bears the responsibility of his opinion, and has to determine his direction and options). While Hassan Al Aali, Assistant Secretary-General of the Nationalist Democratic Alliance Society has said (the opposition has made its final decision and has agreed on the legitimacy of the ruling regime a long time). He added that any other suggestions will only lead to the dispersal of the opposition’s efforts and will create a schism between various components of the society and will be (seditious). He continued by saying "calls for the overthrow of the regime will give it the justification to take strict security measures and implement restrictive laws", rejecting what he called the (Bids), which he claims serves no one. As for Jasim Al Mihza, Secretary General of the Arab Wasat Society, he described Al-Khawaja's call for the use of violence as "odd" and considered it as "rash political immaturity", and that it is (a call to sedition). An independent Member of Parliament, Abdulaziz Abel described Al-Khawaja's speech as "illogical and irresponsible". Embarrassment of human rights organizations was also substantial. Many of them in Bahrain and abroad kept silent so far about summoning Al-Khawaja for interrogation. Al-Khawaja is a well known human rights activist to local, regional and international human rights organizations, and has just become the Middle East coordinator for Front Line Organization – based in Dublin. Perhaps this embarrassment was due to the bitter criticism that the speech had provoked from journalists and from MPs in the local media that it is hard to classify the speech within the framework of defending human rights, and that it may have violated the basic principles of the same rights it had intended to defend. One MP - Hassan Al Dosary - has called upon human rights organizations to denounce the speech because "it is not concerned with rights and thus no human rights organization will be able to defend it" (Al Ayam, 12/1/09). Front Line has issued a statement on 10/1/09 regarding the Public Prosecutor's interrogation of the activist Al-Khawaja and placed the issue in the context of (oppression practiced by the authorities against human rights defenders and their organizations in Bahrain). The Front Line has called upon the authorities, in its ambiguous statement (did not refer to the facts of the case), to guarantee Al-Khawaja's safety, freedom of movement and his right to leave the country considering his position in the organization. The Front Line has demanded that the Bahraini authorities put an end to all forms of discrimination and oppression against human rights defenders and urged the Government to comply with the Universal Declaration of Human Rights and the Declaration of Human Rights Defenders.